Today, I’m going to talk about the word “hate”. When you “hate” something, you dislike it intensely. Hate is a very powerful, strong verb. You may probably want to save the word for those things that you really dislike. And certainly, I wouldn’t use it for people. 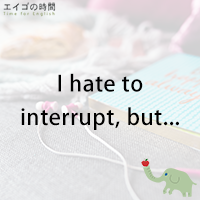 An exception is when you use the word in a sentence like “I hate to interrupt, but I need to talk to you right now”. “I hate to interrupt” means “I don’t want to interrupt”. Likewise, I hate to admit it but I was wrong. I hate to say this but I think you’re making a wrong decision. I hate to ask you this but would you give me a ride? Now this is a useful expression to remember. So I’ll continue to discuss this topic on Thursday on our website. So please make sure to come visit us. I hate to interrupt, but it’s urgent.